It will probably take Lynettea a while to do justice to this awardie. She is fairly slow, which is the reason, we think that we have now received the awardie for the second time. AS we STILL DO NOT HAVE 200 FOLLOWERS. Lynettea says she never expects we will have 200 followers. We are still quite happy to put our views on line and not be famous. Lynettea went to the house of the new kitty today. 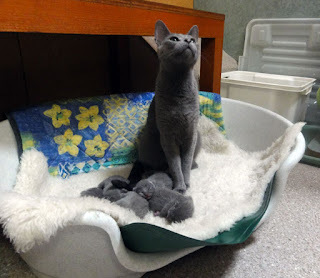 She doesn't know yet which of the little kittys will be coming home to live with us. 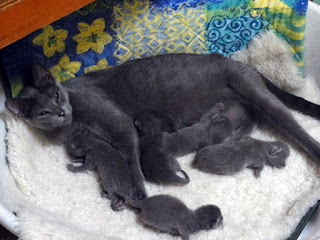 She took some photos of all the kittens and their mother Lena. We will have to think of a good name for the new little boy kitten to have. A Russian type name would be good. We only hope it is not a dangerous and foolish kitten, especially as some of the vegetation has disappeared from the top of The Pond. Lynettea says that the little kitty will not be allowed to look at us unsupervised for quite a long time after he comes home. Are the little kittens cute? Look at their tiny tails! Labels: Photos of Russian blue cat and kittens. 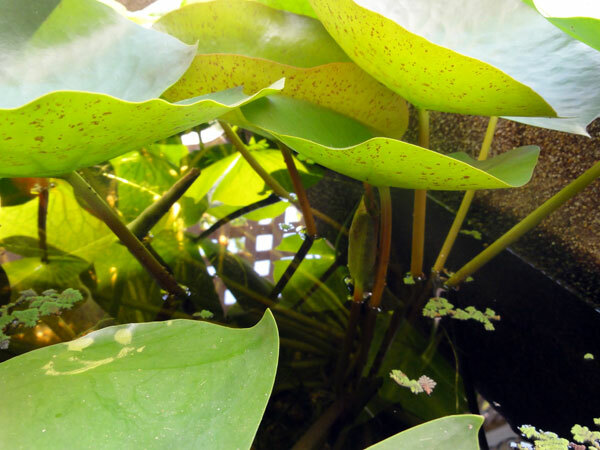 Now all the new little plants are growing bigger and splitting up to make more little plants that swarm across the surface of the pond, it is very difficult for Lynettea to take photos of us. We are no longer the film stars of the pond. We come up for food, but at other times we are busy in our plant jungle exploring and playing with one another. We think that all the surface cover will make us feel safer when the new Kitty arrives. It is also helping keep our water cool in this hot February weather. 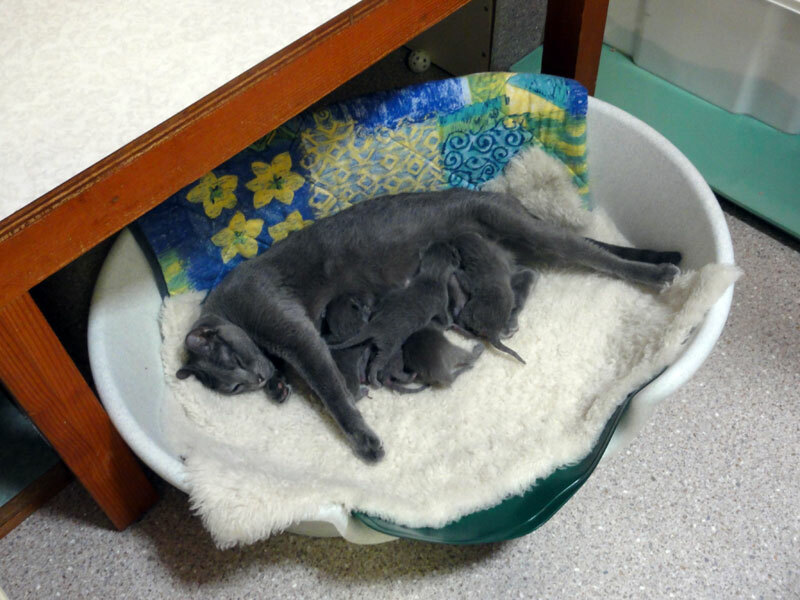 Some new little kitties were born yesterday (13 February) just in time to celebrate Valentine's day. Lynettea is hoping to see them in a few days. She has requested that the kitty that comes to us will be quiet and respectful of fish. We are not quite sure how anyone will know that before the kitty comes. 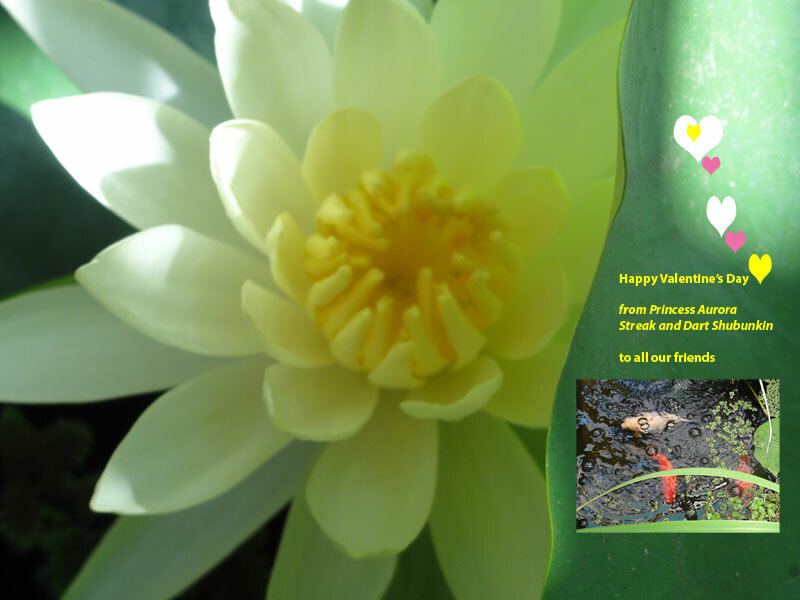 Here is our Valentine Card to all our friends. May you all have a loving and peaceful day. 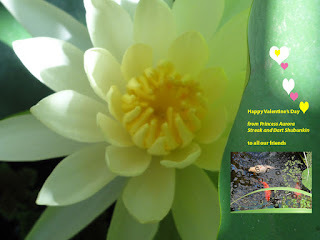 We hope all the humans remember the fish, birds and animals on Valentine's Day and think about their happiness also. Love from Princess Aurora, Streak and Dart Shubunkin. If you can't read the little writings then please biggify the card. 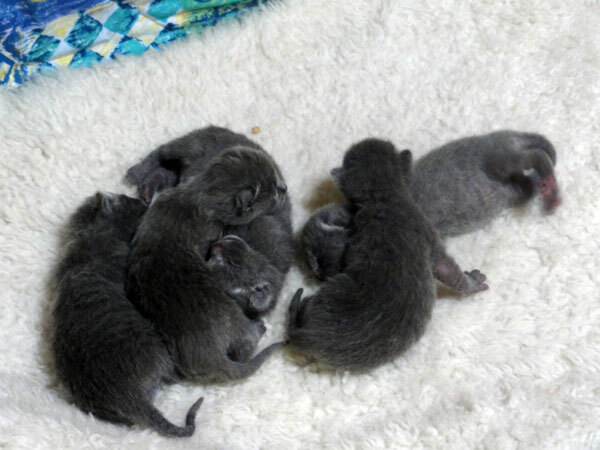 We don't know if there has been a new little kitty born. Lynettea told us there could be a kitty born around the middle of February, but even if this was so the kitty would have to stay with his or her mother for a long time to learn proper cat behaviour before he or she might think about moving to live with us. We hope that such a kitty would not learn too many hunting skills. 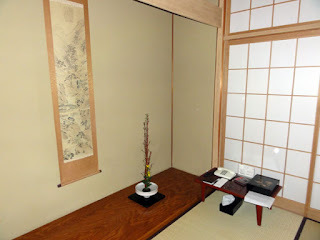 Because we have not been able to look at our new photos (as they are not on the computer yet) Lynettea has let us post some of her travel photos from last April in Japan. 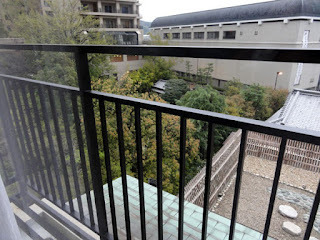 She stayed in Matsuyama among other places and these photos are from the hotel in Matusuyama. 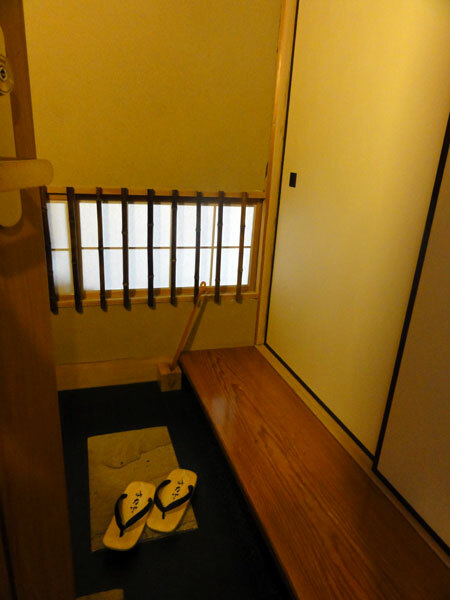 The hotel also has a famous onsen (public bathing area with hot springs). You can imagine that you are waking up in this room with the daylight coming through the paper screens. 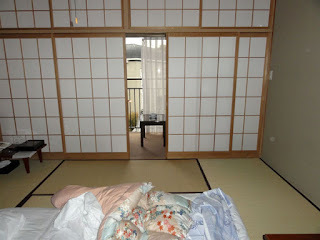 The futon bed is on the tatami matting and the maids have put it on the floor for you while you had your traditional Japanese dinner. The futon is not as soft as it looks, and the pillow is very hard. Lynettea had to sleep with her head on a jumper as her neck did not feel good on the traditional pillow. Outside past the paper screens is a balcony, which has western chairs and table and a view over a traditional Japanese stone garden. Below that is a traditional Japanese garden and the city of Matsuyama. The room you are looking at has an area on the side with a raised section containing a beautiful flower arrangement and a scroll. When you enter the doorway to your room from the hotel corridor you go into a small lobby that is all your own. It has a rack for shoes and several sandals provided. The staff have kindly put some sandals for you near the sliding paper screen door that leads into the first of your rooms. 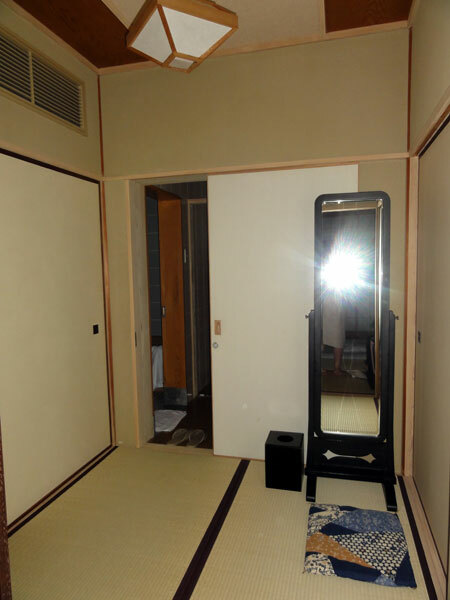 You will also have a small suite of bathrooms. We have a photo of the bath area. 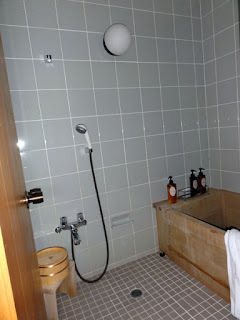 There is a traditional tub, quite deep to fill with hot water. Before you step in the bath you need to wash yourself thoroughly. You can see a small stool with a small wooden tub on it. You are supposed to sit on the small stool and wash yourself with the shower. You can use the tub to collect water and throw it over yourself. Lynettea thinks that is what it is for. Her knowledge is not all that complete. She did go to the onsen on her last night. She asked one of the hotel clerks to explain the way to the public bath, as she had forgotten the first explanation. (We should mention that she was not feeling very well, as she had developed a severe chest infection - but she battled on regardless). 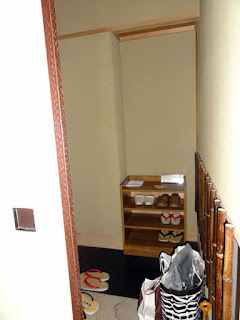 ﻿She was determined to use the onsen so went at 10 pm at night in her yukata (Japanese summer wear provided by the hotel) with her toiletries bag and her slippers. The clerk was very happy and said he would show her the way. They walked for a very long way, which surprised Lynettea, as she had thought it was quite close. She didn't like to say anything. Finally the clerk said, 'Here you are!' and she looked around to find herself in the entrance of the public bar. Fortunately the hotel clerk and Lynettea both had a good sense of humour. Eventually he did take her to the onsen, which was very elaborate with changerooms and both an inside and outside hot spring bath. Lynettea thought she would plunge into the hot spring outside, but the icy blast when she opened the door made her sensibly decide to use the indoor pool. Sorry this is a long story. 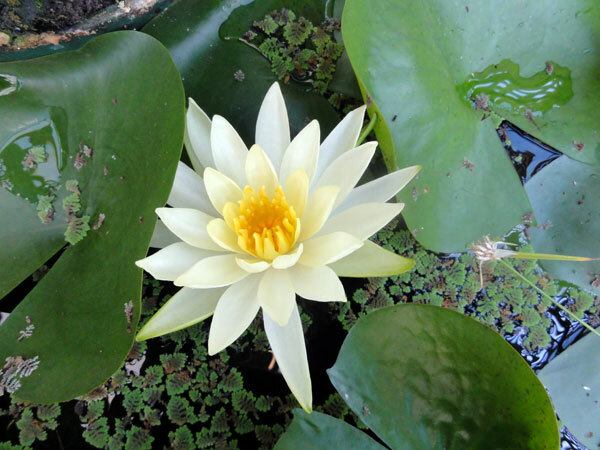 We will have more interesting stuff about ourselves and the pond shortly. 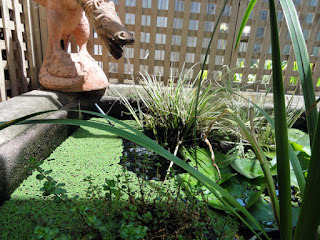 Lynettea hasn't had any time to help us with posting, but she has taken some new photos of us in the pond. Our new water plant on the surface has grown, but there is still space around the Dragon Fountain Splashings for us to come up to the surface. We hope she will put these on our blog shortly. Lynettea was at her Voluntary work at Adelaide Zoo on Monday. She walked around to the Orangutan enclosure to see if her favourite Karta was outside. Karta's baby was still born about a month ago and Karta has stayed mostly inside. She was inside on Monday morning, so Lynettea couldn't see her. She did see the quokkas in the Childrens Zoo and stroked one of them, which was a thrill for her. She doesn't have Diamond now to pat and we do not favour our scales being patted or stroked. My Moon haiku was not one of those chosen for the January Moon Viewing Party. Lynettea says not to give up heart and try again next month. Diamond's haiku were not always chosen either. You can read the chosen haiku here: Haiku Bandit and if you scroll down you can read my submission among the others. It is still cool here, which is most unusual, but we are keeping warmer by swimming around vigorously.